The Letus35 Talon Kit 4 for Canon 1DmkIV (Carbon Fiber) includes the Letus Hawk Viewfinder and the standard Talon Quick Release Baseplate, which consists of the Hawk camera plate, Ratcheting Thumb Screws, and a Ported Baseplate for Rear 15mm Rod Extensions, and a pair of Stainless Steel Telescoping Rods with extended base system. Equipped with a Talon baseplate that facilitates quick attaching and releasing of the Hawk Viewfinder from your camera, the Starter Kit allows you to easily switch between video and still camera modes when using HD movie-capable DSLR cameras. With 3 lenses in 2 groups to minimize pincushion distortion, the Letus Hawk Viewfinder reproduces flat images with no warping or sharpness loss on the edges of the image frame. For durability, the included lenses are contained in a precision-milled aluminum housing. The 2.75x view factor of the Hawk lets you effortlessly see the complete frame at one glance. Meanwhile the viewfinder offers +1.5 to -2.5 diopter correction with a rotatable eyepiece, for near and far sighted users. Made of carbon fiber, the viewfinder shroud is lightweight, strong, and durable.Anti-fogging coating eliminates the need for wiping the viewfinder as well as assures high color fidelity. 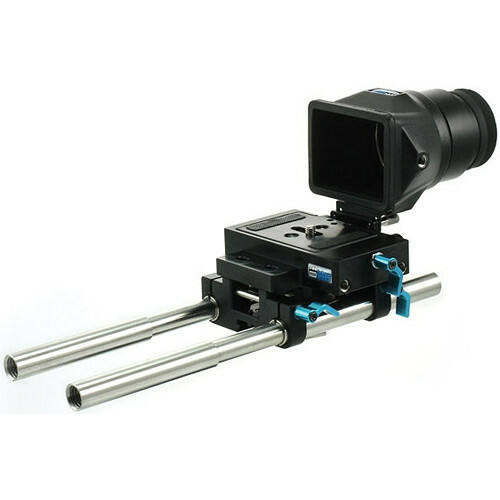 Depending on whether you want the viewfinder to be connected to the camera or the support rods, the Letus Hawk viewfinder can be directly attached to the Talon Baseplate or the quick release camera plate. In addition, the quick release mechanism of the baseplate comes handy when packing up your gear quickly. The baseplate can receive standard, male threaded 15mm support rods to mount accessories behind the camera, while the front of the baseplate is compatible with other Talon rod accessories. The included telescoping rods fit to the baseplate with help of the extended base system, and provide flexible support to use lenses of different lengths. Non-telescoping rods can also be used with the extended base. Box Dimensions (LxWxH) 12.0 x 6.0 x 6.0"